← Blackcurrant at the mini mart…. Which country makes a better malted milk ball? I wish I could say the same for their British cousin, Maltesers. First the name…sounds like a burlesque group, or a dog toy. Next the taste, not so great; Salty chocolate with the malted milk that has a slight grassy finish, not to mention that since these are imports, they are twice the price of Whoppers. 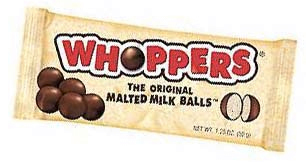 If Whoppers could run, they’d win by a mile. This is the first time I have had a candy from the U.S. beat a candy from the U.K.
Posted in Milk chocolate and tagged malted milk ball. Bookmark the permalink.